Make New Caledonia, the most beautiful place on Earth. This cultural tour is only available at each arrival of a cruise ship. 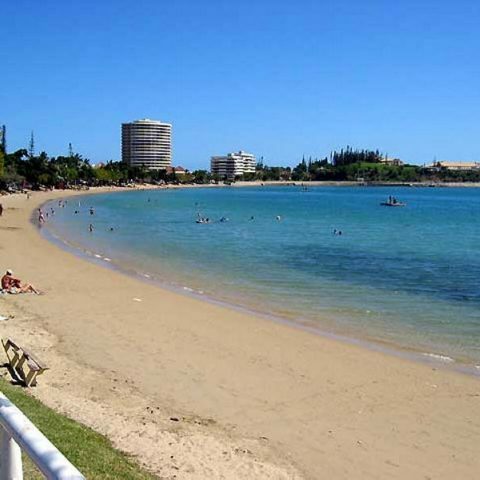 This magnificent guided sightseeing tour offers everything you need to see in Noumea in a day. Travel in our air-conditioned buses towards your first stop “Le Centre Culturel Tjibaou”/ The Tjibaou Cultural Centre”. You will discover the unique architecture of the Center, a polycultural complex, mainly dedicated to Kanak art. This tour Includes entrance fees to the Cultural Centre and a guided tour of about 45 minutes. Then we will head towards the second stop located in the town of Mont Dore, the church at the Catholic mission of Conception, starting point of Christianity in New Caledonia “the church of the Miracles” with the statue of our lady at the top of its bell tower, the remarkable stained glass windows and it’s tropical surroundings with numerous fruit trees including lychee and mango. Then your journey will continue to the lookout situated at Ouen Toro with a 360 ° view of the Caledonian lagoon and the areas of Mont Dore, Anse-Vata, Baie des Citrons, Promenade Pierre Vernier, magnificent mountain ranges to name a few. NB: Toilets are available at this stop. NOTE : In the event of the closure of the Cultural Center TJIBAOU (holidays or cultural events), this stop will be replaced by the natural water source in the town of Mont Dore. Departure every 20 to 25 minutes (depending on traffic) on air-conditioned buses from the Main Cruise Terminal on each day of a cruise ship arrival only. • Municipal Market : Discover the splendid stands of local fresh fruits and vegetables but also the craft market (necklaces, rings, and other local souvenirs). The market is open from Tuesday to Sunday from 5am to midday. Closed every Monday. • Port Plaisance Shopping Mall : This stop next to a Marina gives you the opportunity to shop in a mall with french „prêt à porter“ boutiques, a parfumerie & wine shop, restaurants, a patisserie and a supermarket. An ATM is also available outside, next to the gas station. Baie des Citrons :with 2 separate stops on one of the most beautiful beaches of Nouméa, great for swimming and relaxing on the sand. 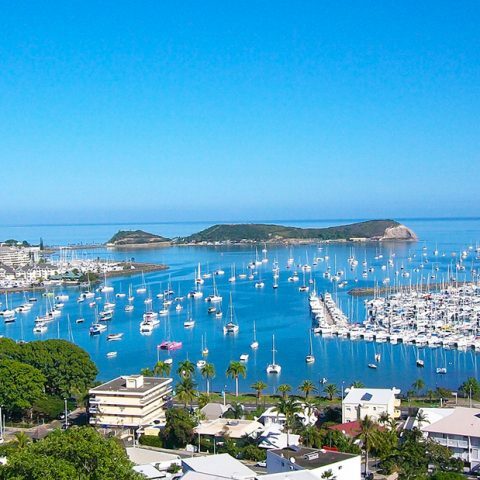 Noumea, is surrounded by a lagoon of pure beauty. This beach is very quiet and protected from the wind and suitable for families with small children. On the waterfront you will find the Restaurant / Bar “Les 3 Brasseurs” a local beer brewery (50% discount on your first drink on presentation of your “Hop on Hop off” bracelet and free Wi-Fi). 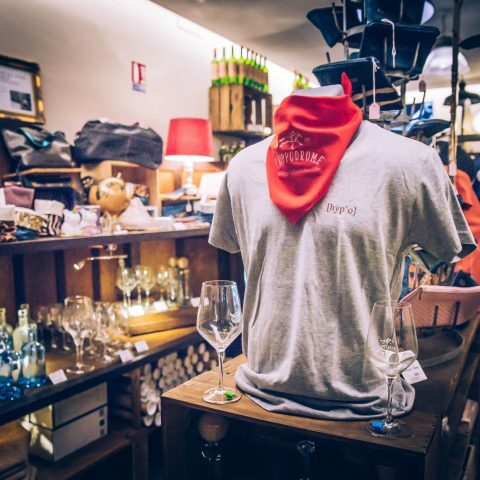 Near this bar you will find a renowned Caledonian chocolate shop “Tonton Jules” (15% discount on your purchases with a tasting, on presentation of your “Hop on Hop off” bracelet). Anse-Vata Bay / Duck Island : This bay is famous for wind and gliding sports including windsurfing and kite surfing. You will find as well possibilites to snack & shop, or you may like just stroll along this largest bay of the capital. And from here you can reach one of the most beautiful diving spots in the Caledonian lagoon, the Duck Island. (Please consult our Duck Island package for bookings and more information). The Aquarium of Noumea :(see the Aquarium package including your entrance fee). The Museum of New Caledonia (200 CFP per person) devoted to the archaeology and ethnology of the Pacific peoples, mainly the Kanak population and works from other Pacific island societies, notably Papua-New Guinea, Wallis and Futuna, Vanuatu and Fiji. Foreign currency is not accepted for the entrance fee. At this stop it will be possible to eat at “Mc Donald’s” (foreign currency accepted). From here you can walk to the main cruise terminal via the city centre or take the bus. The duration for an entire tour takes approximately 45-50 min (depending on traffic conditions). YOU ARE FREE TO CHOOSE YOUR DEPARTURE TIME AND THE DURATION OF YOUR STAY AT EACH STOP. Open every day except Mondays and public holidays from 10am to 17pm. The Aquarium of the lagoons Noumea is located between Anse Vata and Baie des Citrons beaches at 61 Promenade Roger Laroque. The building was founded in 1956 by Dr. René Catala and his wife Ida. Renovated in 2007, it is today a grandiose and playful space, allowing the discovery of all the different aquatic ecosystems of New Caledonia. From fresh water to the deep-sea areas, all the diversity of the Caledonian lagoons is accessible to the visitors in 33 sea water tanks flooded with natural light including the famous fluorescent corals and nautilus endemic to New Caledonia. 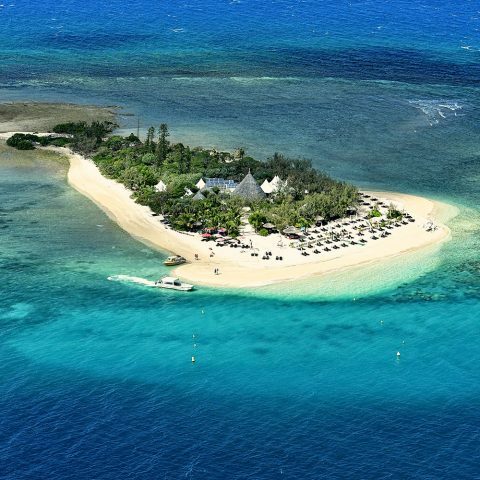 This is the best value island deal in New Caledonia. Others do not come close for value and enjoyment!!! From the moment we meet at the Cruise Terminal till you return your day will have many wonderful memories. Where else could you find a better deal, honestly? At Escapade Island, crystal clear waters & a beautiful white sand beach await you and welcome you to this little piece of paradise, a natural protected marine park. You will marvel at the multi colored coral, the beautifully clear turquoise water and all the tropical fish swimming around the island. “Things to do” are very diverse on Escapade Island ranging from just lying on the beach looking at the horizon, to going on a fun banana boat ride, trying a 30mn jetski ride to the reef, going on a relaxing tour on an aqua cycle, or simply discovering the atoll on a canoe. 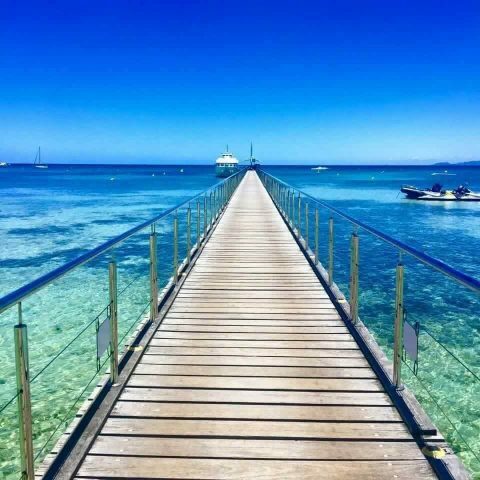 From the moment you will step onto the wharf in Nouméa, to getting on board around 6 hours later, you will be surrounded by smiles, inclusiveness, activities and food!! Our package includes a delicious buffet lunch plenty of fresh & yummy food of an amazing variety: seafood dishes, local recipes, and of course fine pastries !! Some are addicted to them, some like to eat them with tea, some prefer them for dessert. But almost EVERYONE loves them!! So dear cruisers, DONT hesitate any longer and book your seat today! Throughout the day, your local “Gracious Organiser” will be on site to make sure you take advantage of everything the island has to offer. Whether you are a water lover or just want to relax on the beach and watch the day go by slowly, we highly recommend you join us on Escapade island!! We guarantee you will go back home with tons of unforgettable memories and with a more positive image of Nouméa and Newcal! Approximately 10 minutes from Anse Vata Bay, aboard a high-speed taxi boat, you will arrive on this beautiful little coral island, located in the middle of the lagoon. Departures by boat to the island are organised from the taxi boat office at Anse-Vata every 10 to 15 mins. It is a great place for swimming and especially snorkelling. You will find the island a friendly and relaxing place to wind down on a white sandy beach. With fins, mask and snorkel you can discover local tropical fish and live coral species in this protected marine reserve by following the underwater marked trail. The underwater educational panels and aqua guide can take you through 30 minutes of discovery within this special marine environment. 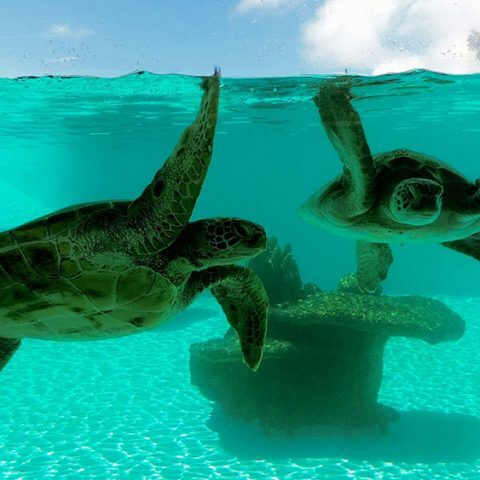 All year long the water visibility is a clear and high quality. You will find refreshments available at the restaurant located on the island. When arriving on duck island, you may encounter pointy shells and corral pieces on the first meters at the beach. Please bring suitable shoes to arrive comfortably onto the white sandy beach area. A hat, sunscreen and water bottle are as well essential equipment and are indispensable especially in summer. You can bring your own diving equipment or hire some on the island. The tour is not suitable for pregnant women or people with severe disabilities. The package includes “Hop-on Hop-off bus” and a transfer (return) by taxi boat. Available every day of the week from 9am to 2.30pm (last pick-up for the bus – 3.30pm), for all cruise passengers. Open all the year from Tuesday to Sunday, except 1st January and 25th December. From 1 September to 30 April : from 10.15 am to 5.45 pm. Du 1er mai au 31 août : de 10h15 à 17h. The Botanical Park and Zoo / Parc Forestier Michel Corbasson opened in 1972, is one of the most popular attractions in Noumea. This park was created to guarantee the protection of one of the last plots of dry forest that exists in the city of Nouméa. Covering an area of 34 hectares, it houses the only collection of live terrestrial animals of New Caledonia. Flora : The park is home to several areas of dry forest, araucaria plantations, a palm grove and a collection of cacti. Fauna : The animal collection numbers more than 700 animals including several species endemic to New Caledonia. Birds, reptiles and endemic mammals are on show for visitors. Some remarkable species included in the park are : the Cagou (Rhynochetos jubatus) the emblem of New Caledonia and protected bird, the Flying fox (Pteropus ornatus), the Caledonian crow (corvus moneduloides) the giant gecko of Leach (Rhacodactylus leachinus). 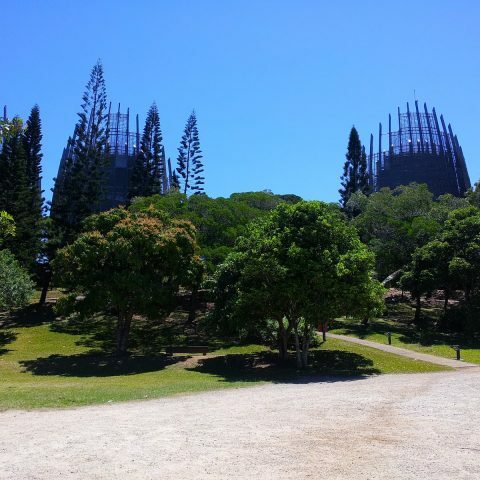 Landscape : Visitors can discover the magnificant views of Noumea and its bays from within the park. 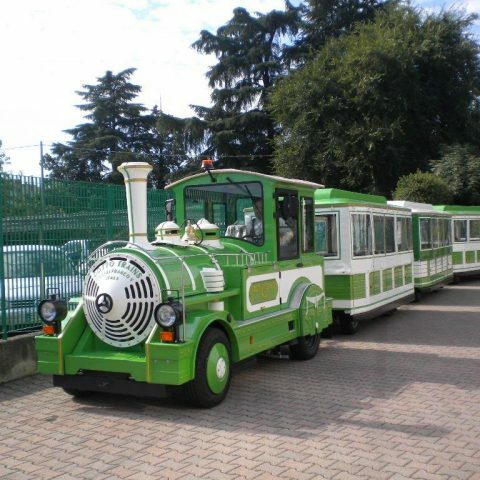 The package includes transfers and admission fees to the park (note this is not a guided tour). You can choose to leave from 10:30am onwards and a last shuttle is around 2pm. You can stay as long as you want 1, 2 or 3 hours. Please wear appropriate shoes and get ready for a long and rewarding day. Open every day except Mondays and public holidays from 7am to 5pm. Minimum number of passengers to open this tour : 10 people. 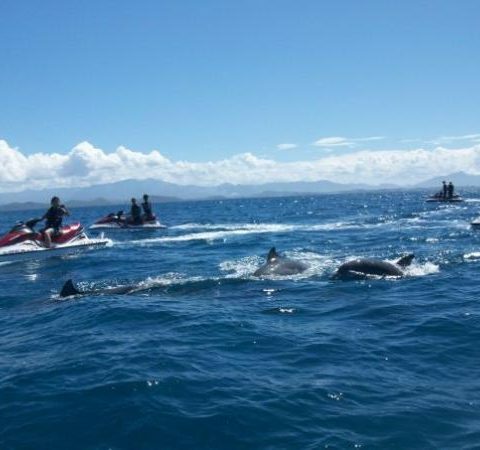 This fabulous site is located 60 km south from Noumea. The Blue River National Park created in 1980, is a regulated area for the conservation of fauna and flora, where you will find a preserved environment rich in biodiversity ! The park covers more than 9000 hectares and offers to visitors a wide range of facilities to discover a world unique environment, from moments of relaxation in the picnic areas, to walks in the forest along the river, but above all the appreciation of the outdoor activities. Only “green” activities are available in the park as the environment is the priority, where car access is restricted to ensure the protection of the flora and fauna. 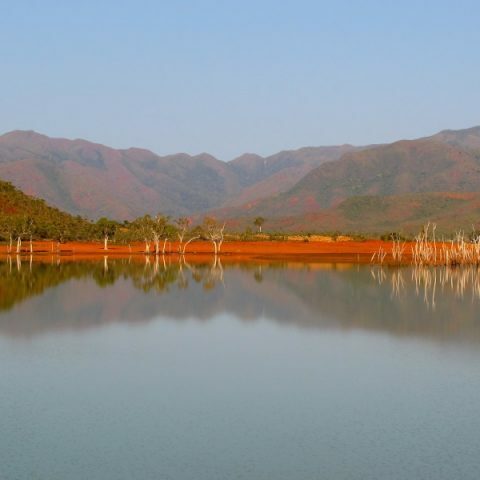 This park occupies a largely wild and magnificent region where nature is closely associated with many diversified natural environments (mining bush, wetland and rain forest). Some areas that you may encounter are :- the Yaté Dam and its surrounding area, the Oak, Araucaria, Grand Kaori forests, the Germain Bridge , the Flooded Forests … to name a few. 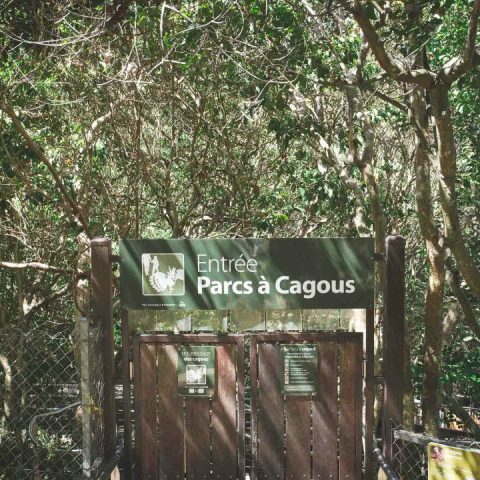 On the way to a swimming area you will surely encounter the famous Cagou, the emblematic and endemic bird of New Caledonia. The park area had in the past experienced forestry and mining operations, which have now ceased. The remains of these activities are still visible (Pont Pérignon, locomobile, railway …) which you may come across during your visit. NOTE : It is strongly recommended to wear appropriate shoes that can get wet. You need to bring a hat, sunscreen, swimsuit, bottle of water and your own lunch. The trip is not suitable for pregnant women or people with severe disabilities. This activity is subject to a minimum quota of 5 people. The Summit Tour offers gives you the opportunity to stop at four of the best lookouts in Nouméa City and enjoy the stunning scenery – The OPT tower hill – The Lorraine Cross at Mount Coffyn – Mount Venus – The Artillerie lookout. This tour starts and ends at the cruise ship terminal and is available to small groups of 8 to 13 passengers. Leave the driving to “Captain Régis” and the commentaries to local guide David who will entertain you for 90 minute ride, packed with historical and fun facts. Departure time is organised at time of booking. Only available in limited number of places either 8 or 13 passengers. 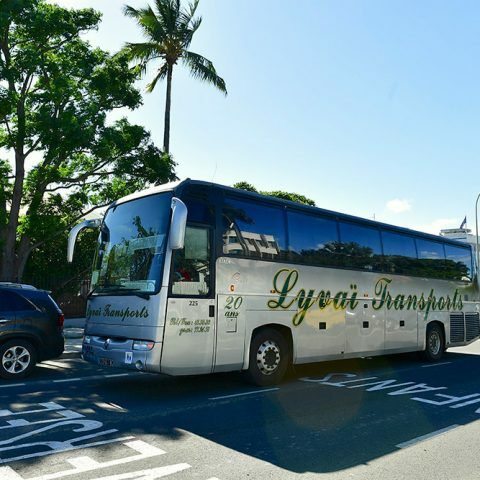 Explore the city of Noumea and it’s surroundings on a private bus with an English speaking guide. Durations of the tours may vary depending on passenger’s choices of destinations. Any special requests to visit any particular places or areas can be taken into account when booking. You can take a ride with us throughout the southem area, to the outskirts of the city towards the fresh spring water fountain of Mont-Dore, the Catholic Church of “La Conception”, starting point of Christianity on the Island and the magnificent Tjibaou Cultural Center, a complex multicultural centre dedicated to Kanak Art. The highlight of this tour is the beautiful lookout of the Ouen-Toro Canon, which has a 360° panoramic view of the Pacific Lagoon, the surrounding islands (Ilot Canard = Duck Island, Ilot Maître = Master Island), the Amédée Lighthouse, and on to Extreme South of New Caledonia. Rent a Jet Ski to explore the Caledonian lagoon. Price for one machine (possibility of 2), for 1 hour. Activity subject to weather conditions. If Cancellation, full refund of the activity. Discover the Caledonian lagoon accompanied by a qualified guide. Make a stop on the Master Island and discover the underwater depths that offer caledonian lagoon classified in the world heritage of the UNESCO. This rate includes transfer to and from the Cruise Ship Terminal. Be careful, you need to know how to swim. It is strongly discouraged for pregnant women and people with reduced mobility. Think of sunscreen, lycra and cap. A waterproff bag will be useful. Possibility of transferring the ticket to the person of your choice. Number of adults Only from 16 years. Get ready for Noumea’s most spectacular boat ride, half an hour of thrilling sensations with 360 ° spins and splashes ! 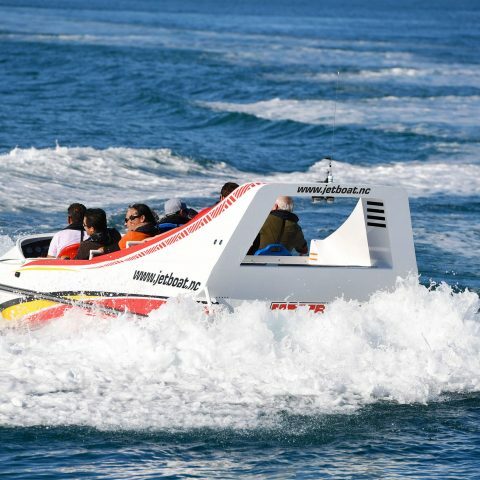 Jet Boat Nouméa, provides a friendly, exciting adventure and safe experience for all families with a highly trained professional driver at the helm. Offer available when cruise ships are at port in the morning only and includes complementary Hop-On Hop-Off shuttle service all day from Nouméa Cruise ship terminal. • Maximum 10 passengers plus the driver. • Minimum height to travel is 1.2 meters. • Children from 6 years old. • Life jackets and full length spray jackets provided. • Food and drinks not permitted on board. Open to the public every day, except Monday and public holidays from 9am to 5pm. 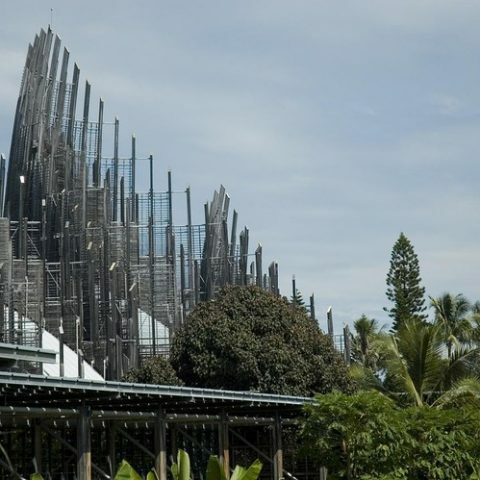 The cultural centre is located about 25 minutes outside Noumea on the tip of a peninsula. The visit makes it possible to experience a cultural jewel, which was inaugurated in 1998, and lies over a vast area of 8 hectares. An original configuration of Kanak culture with its 10 iconic and majestic modern huts designed by the prestigious Italian architect Renzo Piano, inspired by the construction of traditional huts, you will be able to discover a great diversity of oceanic art. Within the centre local customs and traditions are respected, and the different areas include an identity centre, an area for cultural creation and encounters, an art workshop, a museum, conference rooms, specialized library – the Centre’s mission is to research, collect, value and promote Kanak cultural heritage and there is also a gift shop. Our offer includes transfers from the main cruise terminal and entry. (no guide included). With the exception of your guided tour “Country Tour” which we suggest for a duration of 2h30 which includes a guided tour of 45 minutes. This cultural tour is open every day except Mondays and public holidays. Departure from the Cruise Wharf at 10.15am and 1.15pm. Number of places limited to maximum 18 and minimum 5. Welcome aboard the Musée Maritime / Martime Museum located near the city centre of Nouméa, at the start of the road to Nouville. Entirely renovated and enlarged in 2013, the Museum invites you through its new exhibitions and the richness of its collections, to explore the maritime history of New Caledonia and to discover the extraordinary journey of French explorer, La Pérouse, You can discover a collection of nearly 2,000 archaeological objects from the wrecks found in New Caledonia and the site of the sinking of La Pérouse’s vessel. Temporary exhibition spaces allow the visitor to deepen or discover various different topics throughout the year relating to diverse themes connected to the maritime environment. Play areas are also available for “young explorers” and their families to discover the museum and to learn maritime history while having fun. 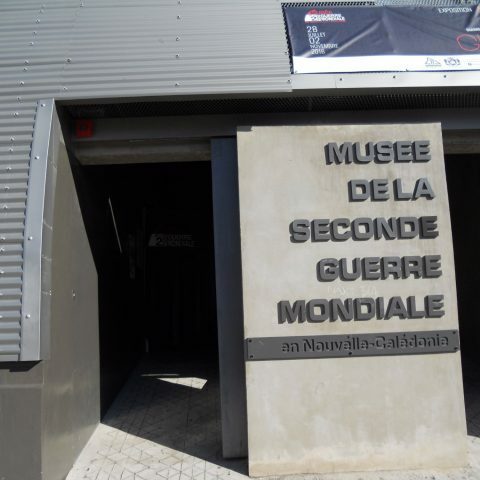 Your museums visit will then lead you to the discovery of the period of the 2nd World War. Discover the stories behind the presence of the US Army GI’s in New Caledonia, and the Australian and New Zealand Army Corps, also. You will see many objects including tanks, jeeps, medals, uniforms and much more. The years between 1942 -1946 remains a very eventful time in the collective memory of many Caledonians and today is proudly remembered in the exhibitions of this museum. The epic stories of the volunteers during the American and the ANZAC troops presence are deeply rooted in the history of New Caledonia. This period generated major upheavals both in the daily life and in the mentalities of the Caledonians. While for the majority of countries the Second World War is synonymous with horrors and destruction, it had a very different meaning in New Caledonia. American, Australian and New Zealand soldiers and also the complete Pacific Battalion, were based in Nouméa and which hired more than 800 volunteers over that period. This is why this new museum aims to convey the memory and events of this era as an important part of local history. The museum reflects this paradoxical vision of a war that was rather “positive” for the “Caillou” (French nick-name for New Caledonia meaning “the rock”) despite the difficulties and traumas suffered by the population. This new museum is housed in Avenue Paul-Daumer, in a renovated original corrugated iron building called “half-moon” which was built in 1943 by the American army and used as a warehouse for their equipment. Unique place to live, “a concept-village” of pleasure and exploration of the incredible beauty of life. Find out our senses. Listen to the sound of happiness. Contemplate the richness of nature. Feel the time emanations. Touch the time stands still. We meet curious enthusiasts with the finest palates, bistronomy lovers epicureans, lovers of fine wine and great minds. A farandole thrills, exchanges and lives French style new “aristo-wine-culinary” experiences. The peace and tranquility of a quality service… Avid and unique culinary discoveries. The Chai de l’Hippodrome and its team travel in an atypical atmosphere. An alliance of contemporary and authentic style in a true Bordeaux wine making cellar. A teleportation of welfare, a transportation to the palace of flavours. A resolutely luxury casual style, completely original, between treasures and stimulation of senses, we toast in the pure tradition of terroirs, vineyards, culinary savoir faire and French bistronomy. Come to learn and appreciate the passion and real story of wine with a sommelier. We are impatient to share with you our elitist products, exclusive wines and a innovative concept in New-Caledonia. Come to the Chai de l’Hippodrome to degust 3 cheeses and taste 3 Bordeaux wines, with educational content like French cheeses maps and wine movies. Presentation one after another with informations about soil and grape variety. During 2 hours, you can ask any questions to the sommelier at the same time. Car rental is only available when Cruise ships are in port. Morning Ships: From 9 AM to 3.30 PM or 4 PM (depending on cruise ship’s arrival). Afternoon Ships: From 2.30 PM to 7.30 PM or 8 PM (depending on cruise ship departure time). 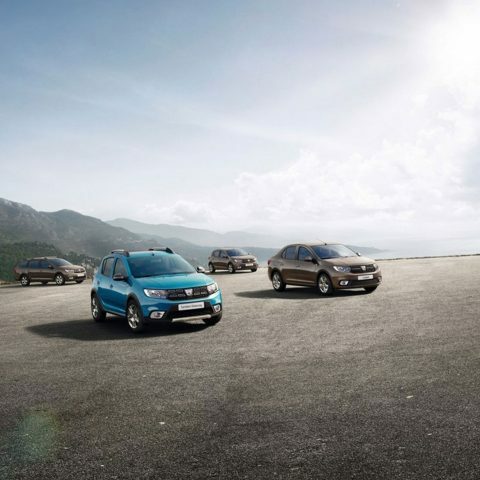 Vehicle: Dacia Sandéro (automatic transmission – 5 seats – 5 doors). 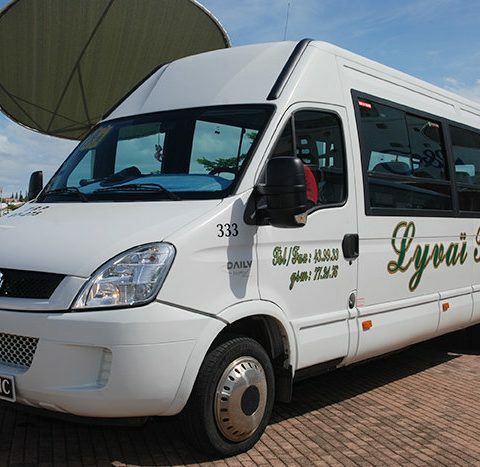 School transport for your children, Lyvai ensures punctuality, safety and special attention to each child. NOTE : Our rates are a monthly flat rate, regardless of school period (see contract).